Jesus and his disciples had sailed across the sea. When their boat reached the other side, a great crowd gathered around Jesus. A ruler from the synagogue, named Jarius, found Jesus and asked him to come to his house and heal his daughter who was dying. Jesus agreed to come. On their way to Jarius’ house, a woman who had a problem with bleeding was in the crowd. She had tried every possible thing to cure her aliment, and had spent all her money doing so, but she only got worse. Upon hearing that Jesus was nearby, the woman went looking for him, thinking that if she could just touch he clothes she would be healed. The woman pressed through the crowd and touched the edge of Jesus’ clothes. As soon as she did this, she could feel in her body that she had been healed. Jesus also knew immediately that power had flowed out from him. He asked the crowd who had touched him. The disciples thought Jesus was crazy for asking this, since there were so many people crowded around and pressing against Jesus. Jesus insisted that he had been touched, and continued to look for the person. Finally the woman who had been healed bowed down before Jesus and confessed that she had touched Jesus. Jesus told her that her faith had made her well. As this conversation was happening, someone from Jarius’ house came to tell him his daughter was dead. Jesus told Jarius to not be afraid, just believe. Upon arriving at the house, Jesus told the mourners to leave because the girl was not dead, only sleeping. 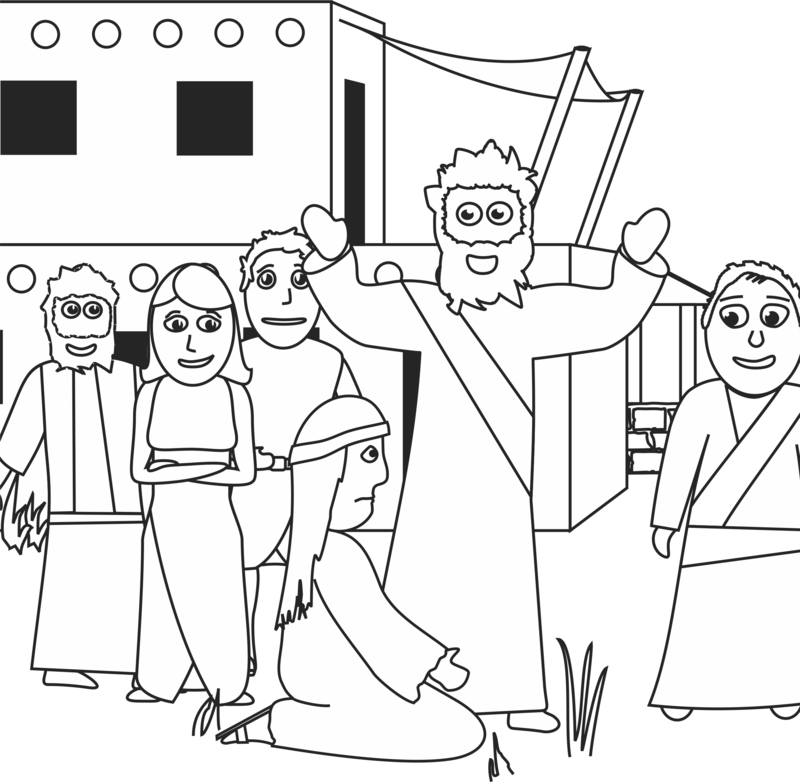 He took three disciples and the girl’s parents into the house, took the hand of the girl and told her to get up. Instantly the girl stood up and walked around and Jesus encouraged the parents to give her something to eat. 1. Put your objects into dark plastic bags. 2. Tell the children that we gather information through our senses. Today we will explore the sense of touch. 3. Have the children reach into a bag and describe what they feel without looking at it. (soft, hard, long, sharp, cold, wet…) They do not have to guess (unless you want them to), but simply describe. 4. Ask the children what they think it must have felt like for the woman who touched Jesus’ clothes. 1. Before class, write the words “Just Believe” on two pieces of paper. Be sure to write the words so that none of the letters are touching. Cut out the letters like a puzzle, being sure to keep the two sets of pieces separated. Put one letter into each balloon and fill the balloon with air. Place each set of balloons into its own large bag, to keep them separated. 2. Divide the class into two teams. Give each team one bag of balloons. 3. When you say go, have the children race to pop all their balloons, retrieving the papers that are in each balloon. Tell them to put all the pieces of the puzzle together to reveal the secret message, “Just Believe”. 1. Color the craft template. 2. Cut the excess paper off following the lines provided. Set aside the bed. 3. Cut out the little girl. Cut her in half along the line provided. 4. Fasten the little girl to the bed by using a paper brad. 5. The children can retell this part of the story using their picture. The girl can be laying down on the bed, sitting up, or standing beside the bed as they tell the story.